Intended use: Conditioning/training runs, heel/rearfoot strike biased. 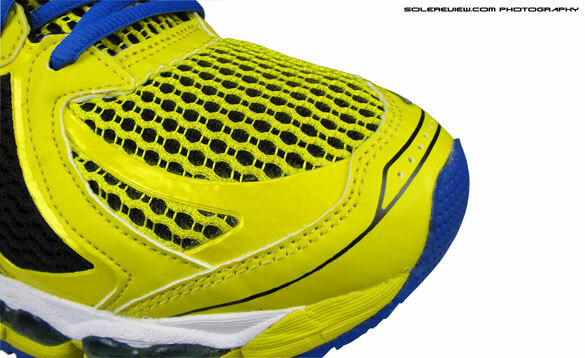 Midsole: Dual layer compression molded EVA, Gel cushioning units in heel and forefoot, thermoplastic 'Trusstic' shank. 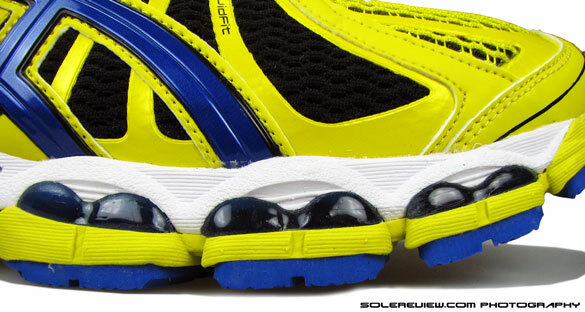 The Asics Gel Nimbus 15 feels way plusher than the 2012 version, both in the upper and the ride quality. This is a go to shoe for the cliched pillowy feel, but might get in the way of runners who are looking to do speed work. After days of wear-testing the comparatively minimal Speedform Apollo and Kinvara 4, switching over to a pair of Nimbus 15 was a shock, both for the knees and brain. The knee, because it didn’t know what to make of the plush, foam and mesh cocoon attached to the foot further down. It reacted with a mild frontal pain after a few miles, and this only proves that while switching from traditionalist to minimalist shoes needs conditioning, the reverse holds true too. The brain, because it wasn’t quite expecting this. The brain reached into its inner recesses, and the memories associated with the Nimbus 14 conjured images of a firmer ride. It wasn’t supposed to be like this. But it was, and by the time we finished our first 5k on the Nimbus 15, revelation dawned that the Nimbus had undergone a complete transformation in just a year. The Nimbus 14 was all about a stable yet cushioned ride, suited for runners shopping for a shoe which combined neutral, low and high arch compatibility. 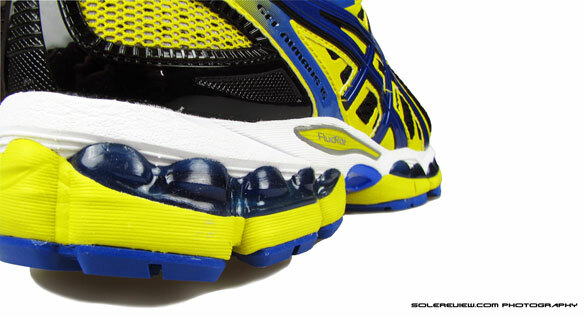 In comparison, the Asics Gel Nimbus 15 narrows its focus to meeting the needs of neutral and high arched runners. This change, like any other, will not result in universal happiness, pleasing and disappointing at the same time. Its sink-in, plush sensation of cushioning will make many happy. Like runners who are heavy and want a lot of cushioning. Or runners seeking a pair of shoes to do their slow paced, recovery runs in. On the flip side, the Nimbus 15 displaces expectations associated with the evolution of the Nimbus 14. Runners who bought the Nimbus 15 based on their experience with Nimbus 14 will find that the new shoe has a new intent and purpose. Plush cushioning – lots of it. More forefoot Gel units than the 14. Ride is way softer. Compared side to side, the sole units looks visually similar, but structurally it is anything but. Look more closely, and the differences start becoming noticeably apparent, the visible Gel units being a major one. 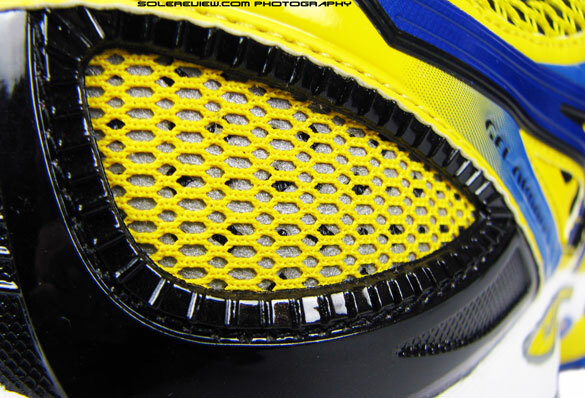 The forefoot and heel area is now visually dominated by the sheer number of Gel cushioning inserts. This layout results in 100% Gel coverage under the heel and forefoot, impacting how the shoe feels during heel strikes and toe-offs. The heel to toe layer of white midsole foam (introduced in the Nimbus 14) has its cushioning dialled up a few notches, making it softer than the one used in the Nimbus 14. The layer of foam separating the Gel units and the outsole doesn’t seem to have changed in softness levels, and the outsole carries over the use of hard rubber (heel) and softer blown rubber (forefoot) units. 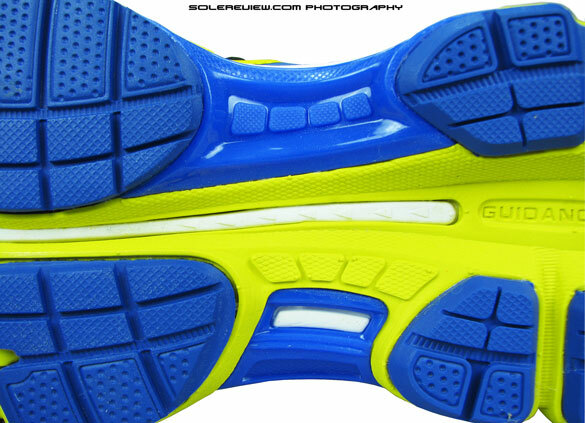 The use of additional Gel units makes the midsole of the Nimbus 15 much thicker. When we measured the sidewall thickness of the midsole layer, the Nimbus 15 came in approximately 2 mm thicker than the 14. While we cannot say for sure whether the forefoot and heel height has increased accordingly (we’d have to drill a few holes in the shoe to find that out), the difference in thickness logically accounts for the increased level of cushioning. And when we say increased, we don’t mean turning the volume knob from 10 to 13. It is twisting the dial all the way clockwise, till the speakers start drowning in their own sound and having the otherwise mild mannered neighbours banging your front door with a ferocity previously unseen. We’re serious. The Nimbus 15’s ride is all about pushing the frontier on plushness, and we’ll even go to say, it is the most plushly cushioned ride in the 2013-14 running shoe line-up. The marshmallowy, sink-in sensation makes no effort to disguise itself once you’ve put the shoes on and take your first step. If you currently have a pair of Nimbus 14’s, go to a running shoe store and try the Nimbus 15 right out of the box. Even when you’re just walking on the hard shop floor, the sensation of softness travels up the body from your foot to the brain in flash of a second. Later, when you’ve paid $145 for the Nimbus 15 and take them for a short 5k, the soft landings become your new friend. You will, though miss the firmer ride of the erstwhile Nimbus 14. 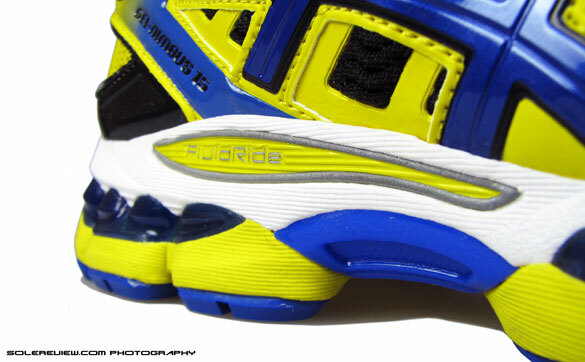 This also means any hopes of tempo runs in the Nimbus 15 will be squashed under its pillowy heel. This is not a shoe meant to build speed – we say this to dispel any misgivings a potential buyer might have, based off their Nimbus 14 experience. 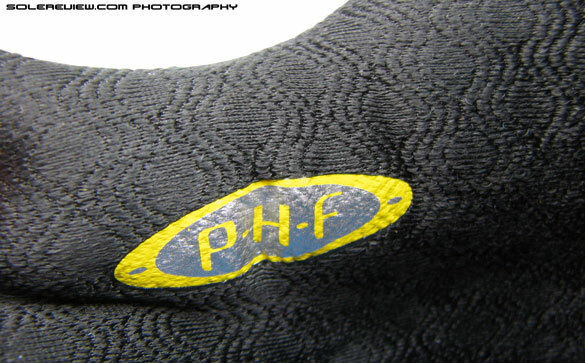 PHF? It means ‘Personal Heel Fit’. Asics euphemism for padded collar area. 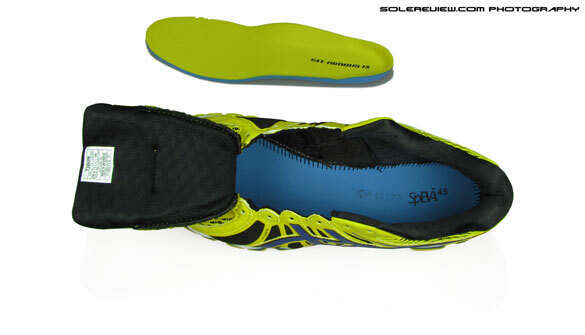 The upper bulks up relative to the increased use of material in the sole. The lateral (outer) collar height increases (vs. a Nimbus 14) by a dramatic 5 mm when measured upwards from the sockliner base, and the heel height at the Achilles dip is at least 3 mm higher. The result is a better, foamed padded fit around the ankles, with soft-to-the touch lining material brushing up the sides. The shoe also eschews the use of all over molded overlays and instead uses plain synthetic leather. The use of high frequency welded overlays is commonplace in the Nimbus 15, more so than its predecessor. Overall the shoe comes across as ‘more-layered’ compared to the relatively spartan set-up of the 14th version. Doubled layered spacer mesh is oh-so spongey. We like. Many clever bits, but much heavier than the Nimbus 14. The ilk of Nimbus and Kayano have never skimped on quality of materials, and the Nimbus 15 carries on that tradition proudly. The upper mesh is an updated two layer spacer type which has plenty of bounce in it, and we particularly favour the use of padded mesh on the sides of the forefoot, covering the first and fifth metatarsal (small and big toe in English). This keeps the forefoot area free of the hemmed-in feeling, and accommodates different foot types. The toe box now features a ‘bridge’ of synthetic leather connecting both sides of the eye stay (the panels with the eyelets), and this separates the tongue from the mesh in the forefoot, which was unlike the case with Nimbus 14. The toe box now features more mesh – around 12 mm when measured from left to right, while slimming down the leather. The extra mesh is now supported by a thin, welded strip on one side to keep it from leaning inwards. A natural consequence is better forefoot flexibility, adding to the all-around plush character. Just when we were feeling overtly impressed, with smug smiles all around, we decide to weigh the shoe on the scale. We must point out that we use a precision weighing balance for our all shoe reviews, which gives very accurate readings. We put the Nimbus 15 on the scale, and it immediately answered with a series of red digits in the counter. We could not believe our eyes, so we weighed it again. It was the right the first time, and the same red digits glared angrily back at us. A half pair of US 11 Nimbus 15 came in at 380 grams/13.4 ounces. Our reason for disbelief? The 2012 Nimbus 14 weighed 331 grams / 11.7 ounces, that’s why! That is a straight 50 grams increase over the previous year, and the Nimbus 15 could easily be one of the heaviest running shoes right now. A little less than the Mizuno Wave prophecy but more than the Glycerin 11, which is similar in construction. Kind of a one time Batman Christian Bale transforming to Irving Rosenfield in American Hustle. We’re certain that the abundant use of the silicon Gel cushioning is the source of increased flab on the Nimbus 15, and the weight is a trade-off for all that undiluted plushness. Talk about silicon excess. Look past the weight, and the Nimbus is still well behaved when tracking a straight line. Thanks mostly to the ‘guidance line’ in the midsole, which visually and structurally separates the longitudinal halves of the outsole. The concavity keeps the foot centred during running, as the foot strike builds pressure along the path of least resistance, which in this case happens to be the guidance line. The outsole has large individual pieces of textured rubber spread across, so the all point contact helps achieve a hassle free foot transition. The midsole set-up helps too. The shoe’s use of the geeky sounding ’Trusstic’ mid-foot shanks aid torsional stability. The sole is very durable too; we’ve got more than a few miles on the 2012 Nimbus 14, and there isn’t much wear to show for. 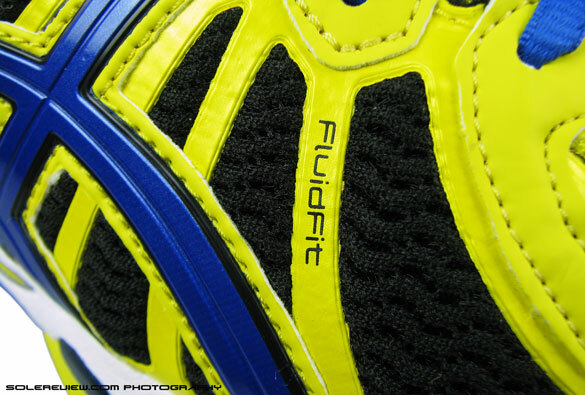 The same material is used in the Nimbus 15, so expect similar abrasion resistance levels. Reflective inserts in the midsole. Some smaller details have been re-worked on the Nimbus 15. Like the new shape of the external heel counter, the inclusion of the reflective heel inserts (absent in the Nimbus 14), and redesigned reflectivity on the toe box. The lateral side of the midsole also has a new reflective insert calling out the ‘Fluidic Ride’ technology, which we assume to be Asics-speak for the combined structure of the multiple midsole layers and the Gel inserts. The Comfortdry drop-in sockliner is a carried over from the Nimbus 14, with the SpEVA lasted layer beneath it. 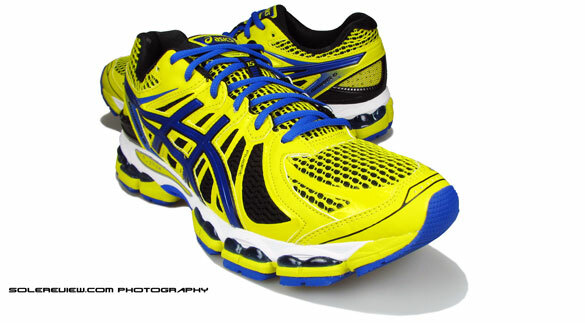 Both of which, conveniently add to the cushioning and fit of the Asics Gel Nimbus 15. To sum up, the Asics Gel Nimbus 15 is a shoe you should be buying if a blend of cushioning and support is what you’re shopping for. It does these two things better than most of the shoes out there, and while the Nimbus 15 might have gained some weight in a year, it compensates with dialled up plushness. The Nimbus 16 just made its way into the market, so the Nimbus 15 will be available for much less than its $145 retail price.